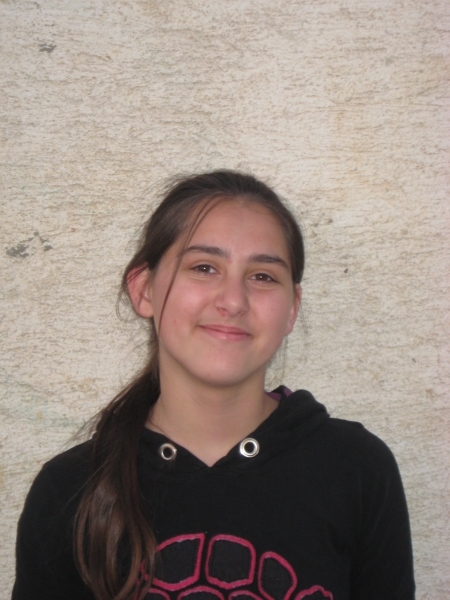 Iuliana Marcica (born in the summer of 1997) and her brother Iulian Mihai came to Hand of Help in September, 2010. Both parents had died within a short time. Their father was doing spring tree pruning when the branch under him unexpectedly broke and he fell to the ground and died. Their mother had cancer for a few years and died the following August. The medical bills had proven to be an immense burden on the family. The children have one older brother that is very mature and who has stayed home to care for the house, working odd jobs in the village during the day to support himself. Iuliana is a very kind sister and helped her little brother adjust to being at the orphanage, as only she could. She would stop by his classroom often to reassure him that he was safe. Her love for her two brothers was soon manifested in her relationships with the other Hand of Help children that soon became as brothers and sisters, too. She grew up to become an obedient young lady. She finished high school and continued her studies as a pharmaceutical assistant. We were so happy to see her begin a new journey as an independent woman and also as a wife. We were able to participate at their wedding and financially help the young couple and gift them the necessary household items every new family needs. Please keep Iuliana in your prayers as she strives to be a woman of God, an example to her brothers and a light in this world!